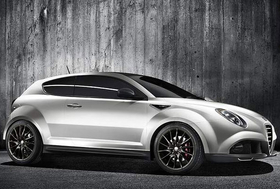 A performance concept based on Alfa Romeo’s hot new hatch, the MiTo, will be shown at the Geneva auto show in March. Called the MiTo GTA, the car has a bit of a tuner feel to it. It’s been lowered 20 millimeters, or 0.8 of an inch, and power comes from a turbocharged, 1.7-liter engine that makes 240 hp. The unit also has direct injection and variable valve timing. GTA stands for Grand Turismo Alleggerito. The last word means “reduced weight” in Italian, and the concept is fitted with a number of carbon-fiber parts, including the spoiler. Aluminum is used in the braking system, the suspension and parts of the chassis. The GTA is a concept, but the MiTo appears to be a good bet to come to the United States if the Chrysler-Fiat merger comes to pass.